Image Sensors World linked to an interesting presentation from Caeleste, a Belgian company doing custom sensor design. In it, they mention a back-illuminated CMOS sensor with 3840 x 2160 6.5 µm pixels and 2 e– read noise. I have no idea if this will ever see wide distribution, but it does suggest that the future for high sensitivity, low noise cameras is promising. The Sutter 421 LED combiner. 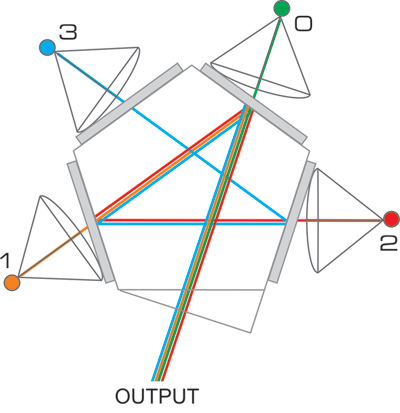 The number at each position indicates how many reflections that LED undergoes before reaching the output. Image courtesy of Sutter. One of the many nice things about this concept is that changing LED wavelengths is really easy: you just replace the LED and the filter in front of it. 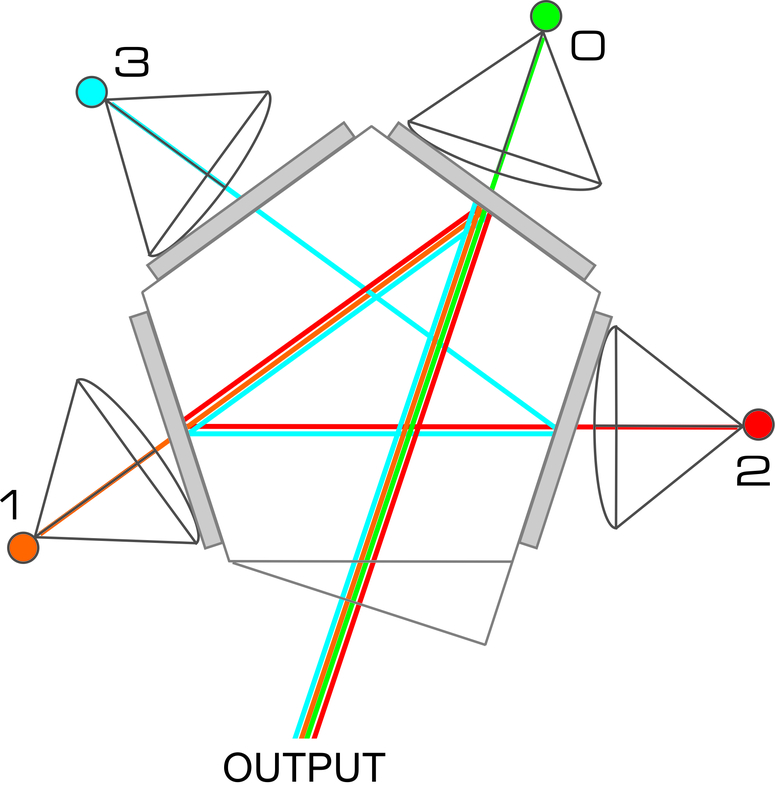 You can also mount a second pentagon on the first to combine up to seven wavelengths (in principle you could even cascade a third pentagon to get 10 wavelengths, but at some point the filter designs get pretty tricky and the losses add up). You can also combine light sources other than LEDs, provided you can find appropriate interference filters. We demoed a six color version of this a few weeks ago, using two pentagons and LEDs for DAPI, FITC, Cy3, Cy5, CFP, and YFP. We tested it with a Semrock Sedat Quad filter set and Chroma GFP/RFP and CFP/YFP filter sets. At all wavelengths tested it was as bright or brighter (in some cases as much as 10-fold brighter) than the Lambda XL we were using as a reference. We’re now working with Sutter to get a seven color version of this (including 340 nm excitation for Fura-2) to install on our microscope. This will allow us to synchronize the LEDs to the camera, so that the LEDs are only on when the camera is exposing, minimizing photobleaching and phototoxicity. This should be a very nice LED illumination option for microscopy, particularly for users who want a modular system that’s easy to modify as needed.